The Dreamland site with its long heritage as an entertainment space dating back to the 1870’s, was saved from being turned into a housing development by an eleven-year ‘Save Dreamland’ campaign by locals and amusement park enthusiasts, whose successful campaigning led to the regeneration of a fire damaged and derelict site, back into a fully operational pleasure park. A re-imagined Dreamland opened on 19th June 2015 as a world-class visitor attraction, providing ageless entertainment through truly re-inventing the famous seaside entertainment experience. The new Dreamland is a unique, vintage-style pleasure park with a witty and timeless design theme. It consists of a outdoor amusement park with the UK’s only Grade II* listed roller coaster along with eighteen other stylishly restored rides, that tell the story of rides through the decades. The amusement park offers much more than just rides with classic sideshows, a pleasure garden of pop up entertainment, a bandstand for DJ’s and live music, an in-house entertainment team known as the Fun Fairers and Betty and Teddy Bear along with a food court of surprisingly good quality seaside food favourites. The free to enter Grade II* listed indoor space, houses an amusement arcade, vintage pinball parlour, roller disco and diner, ice cream parlour, Dreamland retail emporium and the Octopus’s Garden (family entertainment centre). The Pleasure Park is set within a 16-acre landscape capable of hosting national festivals, major events and visiting attractions. 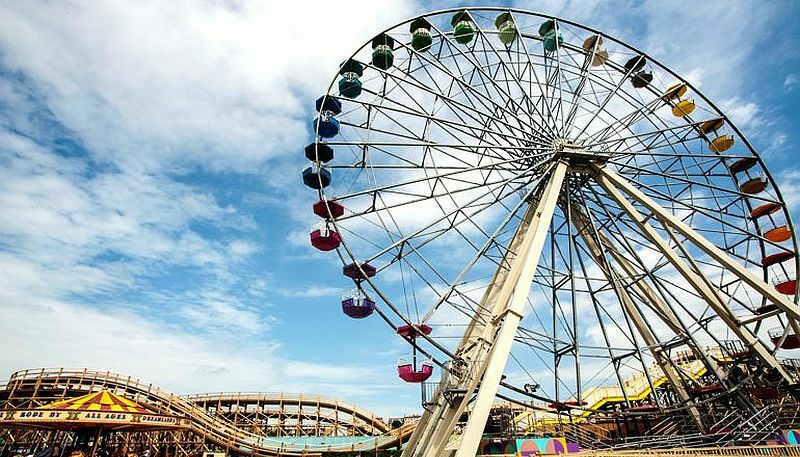 Thanet District Council owns Dreamland’s site. The council, working with The Dreamland Trust secured a funding package of £18 million, which includes external funding from the Heritage Lottery Fund and the Sea Change grant, to deliver the first phase of the project. Sands Heritage Ltd. was appointed in 2014 as the commercial operator of Dreamland and has invested an additional £10 million in the project. The 2015 phase one opening of the Dreamland pleasure park has required the herculean effort of many passionate and dedicated individuals and Dreamland is extremely grateful to the authorities and individuals who have invested time, money and unprecedented community support in the project. The Dreamland project plays a significant role in community engagement, education, training, sustainable employment and boosting the local economy. It is also a major component in the continued regeneration of Margate, spearheaded by Turner Contemporary in 2011. Follow Dreamland on Twitter (@DreamlandMarg), Facebook (dreamlandmargate) and by following #Dreamland.